One of Wales’ top training providers has strengthened its team to deliver a “digital solution” which will see a more streamlined approach to its administration and data collection processes. Alex Hogg, the new management information analyst at Welshpool-based Cambrian Training Company, is devising the solution in response to the Born Digital initiative for work-based learning providers. “The ability to capture data accurately and in a timely manner, with direct input into our management systems, will enable us to utilise real time analysis to enhance business decisions on future investments and improvements to delivering a high quality skills and mentoring service to individuals, businesses and the wider community,” he said. Alex, 36, has returned to Cambrian Training Company after a three-year break, having previously worked for the business as technical support co-ordinator for nine years from 2005. His important new role focuses on analysing management data and producing statistical reports to ensure that the company remains on target to meet its work-based learning contract obligations to the Welsh Government. He is delighted to be back with the company and living in Welshpool again. 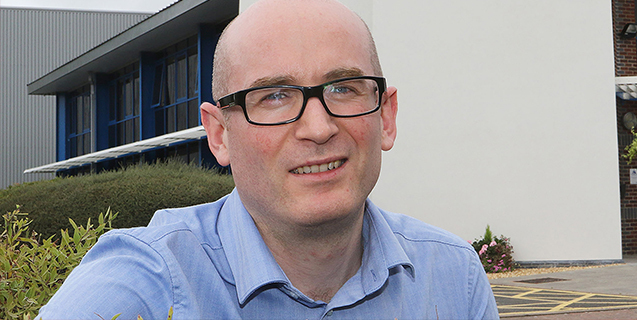 During his three years working for a Wirral software provider, Cambrian Training Company moved to new headquarters on Offa’s Dyke Business Park in Welshpool and continued its business growth. Alex said it was an exciting time to return, with the Welsh Government soon to launch Degree Apprenticeships. He hopes to enrol on a Degree Apprenticeship in data science himself to continue his career development. He has already achieved a GNVQ in Advanced IT at Coleg Powys in Newtown and an apprenticeship in management. Away from work, he enjoys running and is looking forward to the Lake Vyrnwy half marathon on September 9. He’s a member of Maldwyn Harriers, having previously represented Wallasey Athletic. Cambrian Training Company is a multi-award-winning business specialising in the delivery of work-based apprenticeships, Jobs Growth Wales and employability opportunities across a range of industries pan-Wales. Its core business is in the food and drink and catering and hospitality industries. In addition to its Welshpool based, the company has regional offices in Llanelli, Holyhead, Colwyn Bay and Builth Wells.